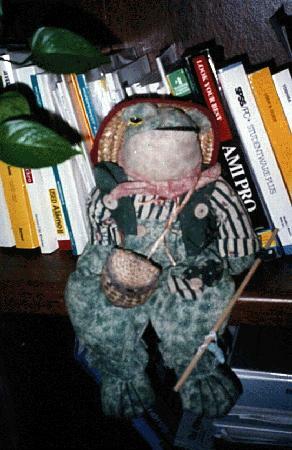 I have some famous frogs, including Froggy the Gremlin, Kermit, Jeremy Fisher, Keropi, and Michigan. J. Frog. 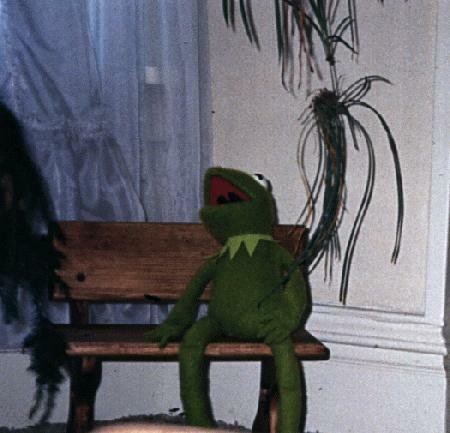 Here are a few pictures of Kermit and Jeremy Fisher. I will add more pictures as I get images made. You may click on the thumbnails to get a larger version of the images. Froggy the Gremlin See Froggy the Gremlin's own web page!! This is one of my Kermits sitting on a little bench. 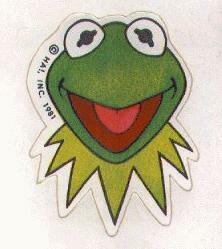 This is a Kermit sticker. This is a Kermit bookmark. 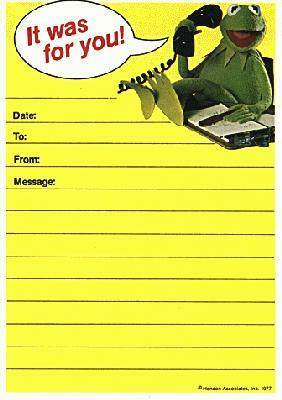 This is Kermit on a note pad. 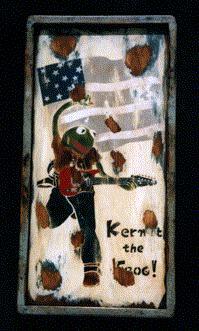 This is a painting of Kermit made by Izumi. 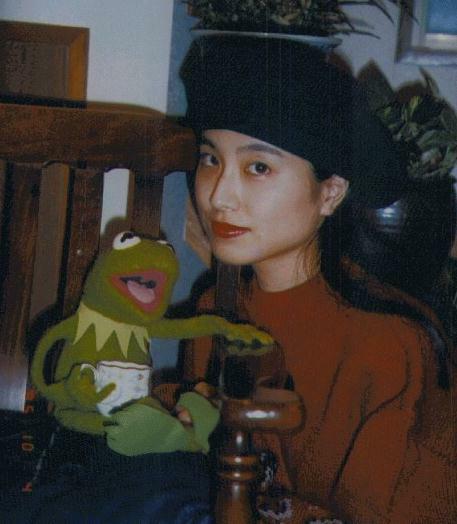 This is Izumi with one of her Kermits. This is another stuffed Jeremy Fisher. This is an embroidered cloth bookmark that I bought when I was in England in 1988. 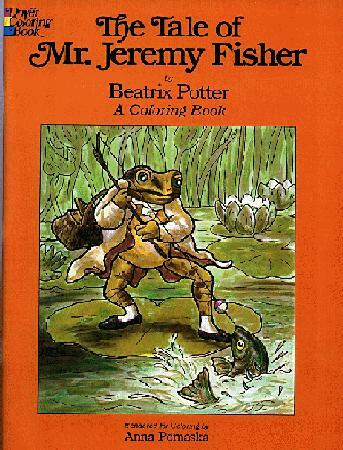 It contains a quotation from Beatrix Potter's book The Tale of Mr. Jeremy Fisher: "Once upon a time there was a frog called Mr. Jeremy Fisher; he lived in a little damp house amongst the buttercups at the edge of the pond....... Beatrix Potter ". On the pack it says "THE WEAVERS OF COVENTRY This pack contains a woven bookmark complete with gift folder and envelope. This is an original Cash's woven bookmark. Fine detail and colouring are achieved by a combination of the traditional skills of artist, designer and weaver." "Copyright J. & J. Cash Limited Makers of fine woven pictures and silk gifts. Torrington Avenue, Coventry, England. Tel: (0203)466466 Telex: 31397 Made in England"
Mr. Jeremy Fisher lives in a damp little house among the buttercups at the edge of a pond, and he loves it when it rains. That's because Jeremy is a frog! One day he decided to go fishing, and he encountered many strange happenings on that outing. Follow Jeremy's adventures in the classic Beatrix Potter story, The Tale of Mr. Jeremy Fisher, now in coloring book form. 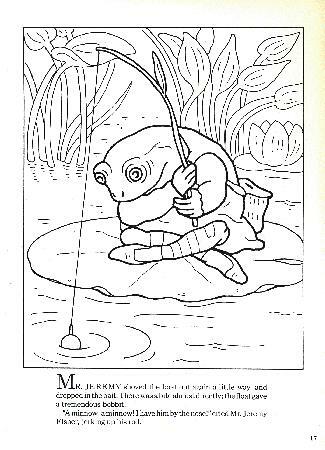 Youngsters can color over 25 charming scenes while they enjoy reading this timeless fable. The enchanting Potter text is reprinted here in its entirety frol the first (1906) edition, accompanied by delightful black-and-white line drawings by prominent children's book illustrator Anna Pomaska. Each meticulous rendering captures the special flavor and whimsy of Potter's captivating watercolors. 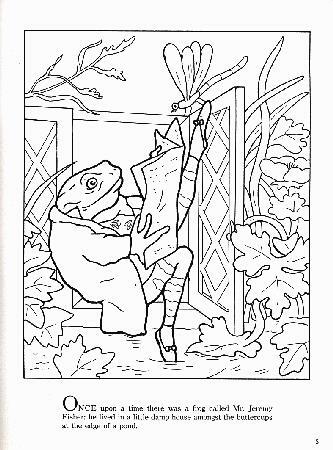 Children will delight in coloring Jeremy Fisher, Mr. Alderman Ptolemy Tortoise, Sir saac Newton, and other apealing illustrations. The perfect introduction to a beloved classic, The Tale of Mr. Jeremy Fisher: A Coloring Book combines the excitement of a good story with the favorite pastime of coloring to provide hours of fun for children of all ages. 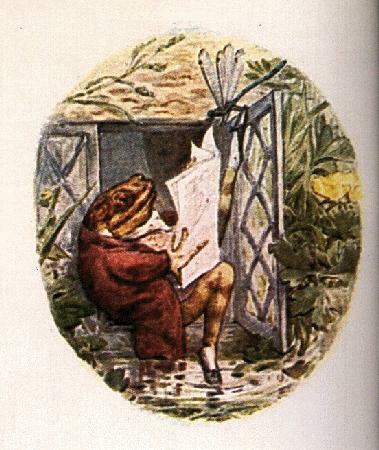 This is page 5" "Once upon a time there was a frog called Mr. Jeremy Fisher; he lived in a little damp house amongst the buttercups at the edge of a pond." 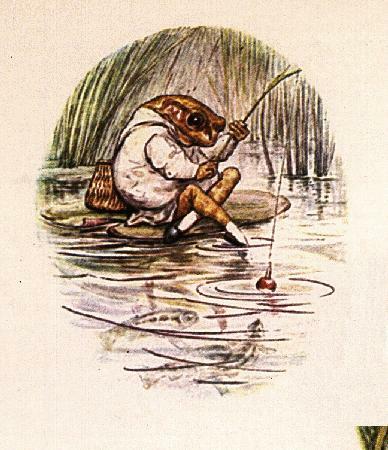 This is one of the original Beatrix Potter pictures that is included in the coloring book, and is the picture upon which the coloring book page above was based. This is page 17: "Mr. Jeremy shoved the boat out again a little way, and droped in the bait. There was a bite almost directly; the float gave a tremendous bobbit! 'A minnow! a minnow! I have him by the nose!' cried Mr. Jeremy Fisher, jerking up his rod." This is another of the original Beatrix Potter pictures that is included in the coloring book, and is the picture upon which the coloring book page above was based. It is also the picture upon which the figure on the bookmark is based.